Dopo lunga gestazione è finalmente giunto a realizzazione Cloud Arrangers, corposo libro fotografico di quasi quattrocento pagine di grande formato dedicato principalmente a musicisti e festival della scena jazz internazionale degli ultimi trent'anni. Con molta stima e riconoscimenti da parte dei diretti protagonisti, e un ampio numero di adesioni alla campagna di finanziamento lanciata qualche mese fa tramite Kickstarter. Ne è giustamente orgoglioso l'autore, Ziga Koritnik: "Cloud Arrangers is the destination of my 33 years on the road as a music photographer. This book is for music, which is so important to me. But it is a book for the new generation, a shout out to everybody involved in music. We need to proceed on our mission, we need to continue with our work. We need to help the scene stay alive. 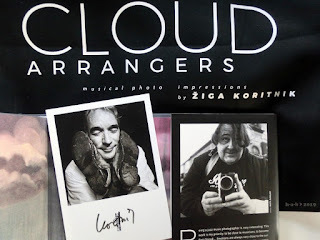 Cloud Arrangers is the work of my lifetime. It is also my first sole publication after Jazzy-ga!, a catalogue which accompanied my first international exhibition at the 1996 Saalfelden Jazz Festival in Austria, one of the most important festivals in Europe. Now that 22 years have passed since I last published a book of music photography – the most recent eight of them spent on planning Cloud Arrangers – it is finally time to release my work into the open. On 376 pages, the book depicts almost all musical genres, from the mainstream all the way to free improvised music. Different genres of photography are also on display, from reportage-style catching-the-moment, both onstage and behind the scenes, to portraits of individuals or groups."